Who Is YOUNG JUSTICE: OUTSIDERS' Geo-Force? 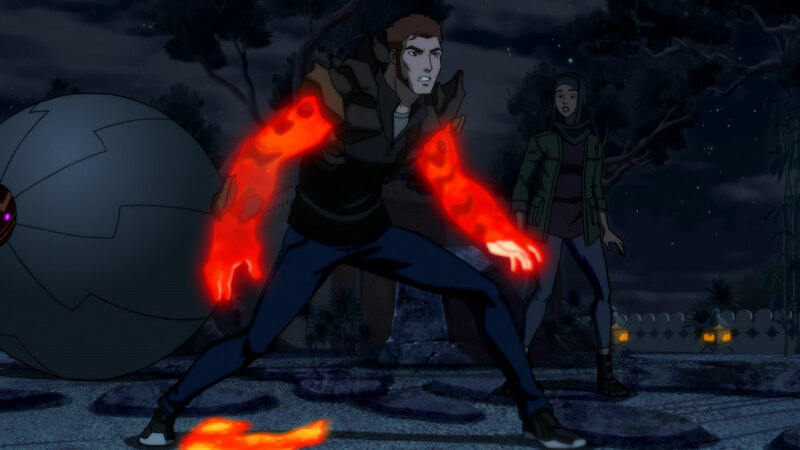 One of the breakout stars of DC Universe's Young Justice: Outsiders is Brion Markov, the crown prince of Markovia, a.k.a. the DC Super Hero Geo-Force. Powered by the terrain of our planet, Geo-Force is one of the most formidable heroes in the DC Universe. Dividing his time between ruling Markovia and fighting villainy alongside the Outsiders, Geo-Force has had a long and layered history. Comic readers first met Brion Markov in the final issue of The Brave and the Bold (#200, written by Mike W. Barr and penciled by Jim Aparo), in a special preview of the comic that immediately followed it -- 1983's Batman and the Outsiders. In this story, readers first got a sampling of Geo-Force’s terrain-based powers. Geo-Force is able to summon lava blasts, propel himself through the air, and manipulate stone matter, which makes things pretty painful for those who are foolish enough to spar with him. 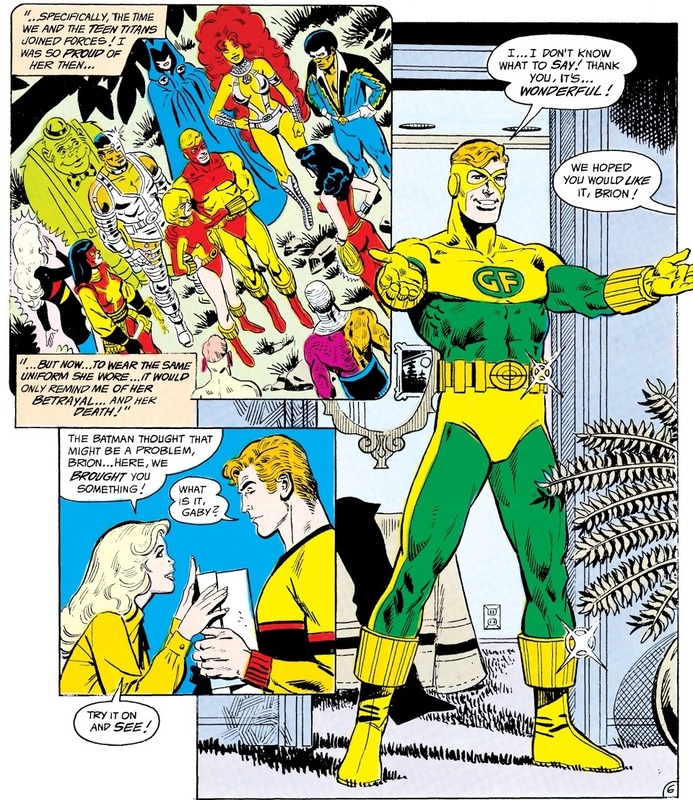 In Batman and the Outsiders #1 (written by Mike W. Barr and penciled by Jim Aparo), fans immediately learned Geo-Force’s origin. Prince Brion was a member of the royal family of Markovia, who wanted to defend his family crown from the invading forces of Baron Bedlam. Brion appealed to Dr. Helga Jace, the royal family physician, to give him terrain-based powers, as she had previously done with his missing half-sister Tara. Dr. Jace complied, and Geo-Force was born! While stopping Baron Bedlam’s royal coup, Geo-Force teamed up with Batman, Halo, Black Lightning, Metamorpho, and Katana. With the kingdom of Markovia safely in the hands of Brion’s brother Gregor, he chose to follow the heroes back to America, where they began formally operating as the Outsiders. In The New Teen Titans #37 (written by Marv Wolfman and penciled by George Perez), Geo-Force was surprised to learn that his sister Tara had also joined an American superhero team. But unbeknownst to Brion, his sister, operating under the codename Terra, was secretly spying on the Titans for their enemy Deathstroke. While their reunion was a happy one, Tara was secretly worried about what would happen to her brother when the time came to betray her team. In an effort to adapt to American life, Brion enrolled in graduate school, studying earth science, since it was associated with his power set. He quickly found American schools more chaotic and disorderly than what he was use to in Markovia. 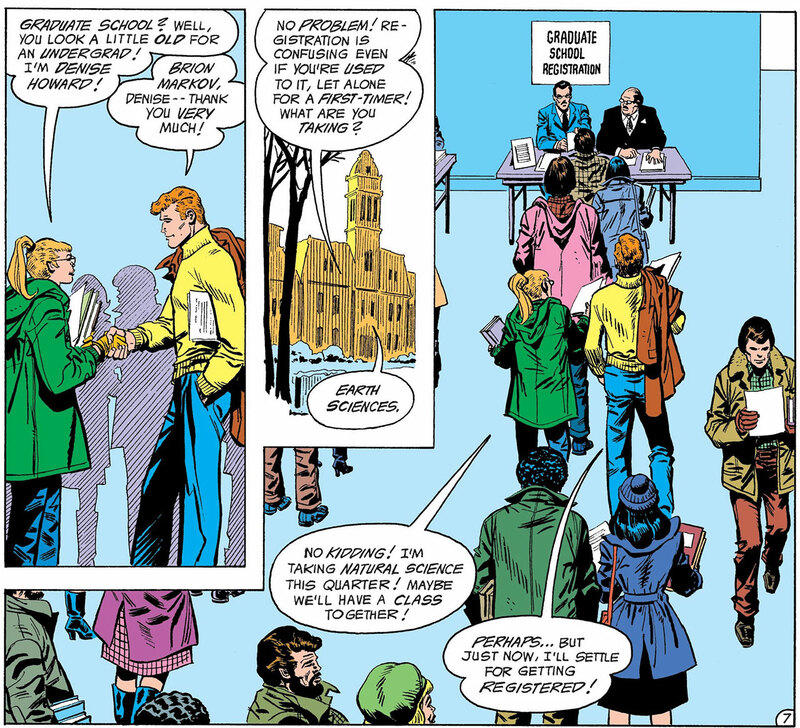 In Batman and the Outsiders #9 (written by Barr and penciled by Aparo), Brion met another student named Denise Howard, and struck up an instant friendship. Meanwhile, Terra made her move against the Teen Titans and helped Deathstroke deliver the team to H.I.V.E. During a climactic battle in Tales of the Teen Titans Annual #3 (written by Marv Wolfman and penciled by George Perez), an angry Terra lost control of her powers while attacking her former team. The onslaught of rocks Terra summoned wound up killing her. 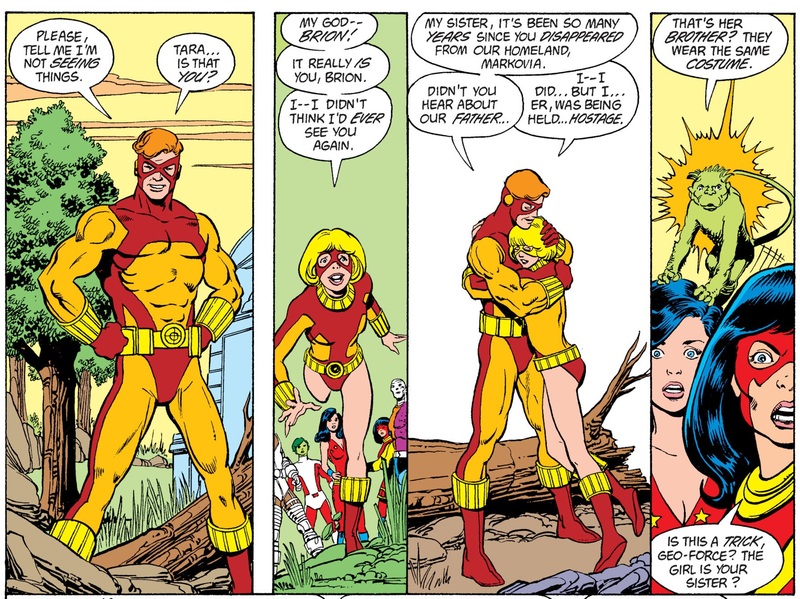 The Titans, however, chose to keep Tara’s treachery from Geo-Force and told him she died a hero. Batman decided it was ultimately best for Brion to know the truth and revealed his sister’s true nature to him. Brion was devastated, and unsure if he could continue as Geo-Force. Brion’s teammates gave him a new costume, since his old one was too similar to the one Tara had worn, which renewed his spirit and enthusiasm. Though the colors were still earth-based, and the same those in his native Markovian flag. During this period, Geo-Force and Halo grew closer together and began a romantic relationship. Alas, their courtship was short-lived, and they mutually decided they’d rather be close friends and teammates. Brion continued to find himself drawn to his increasingly depressed classmate Denise; and comforted her after a failed suicide attempt. Once his feelings for Halo were sorted out, Brion and Denise began dating. Although Geo-Force slipped and had a one-night stand with Looker, another member of the Outsiders, he was able to repair his relationship with Denise. After Batman decided to part ways with the Outsiders, Brion began taking on a more active leadership role. Yet tragedy soon struck when Brion’s brother Gregor was betrayed and murdered by Dr. Jace -- working as a sleeper agent for the group of extraterrestrial robots known as the Manhunters. The Outsiders battle with the Manhunters tore the team apart, and Dr. Jace was killed. Shaken, this first group of Outsiders disbanded and Brion left his Geo-Force identity behind him. Years later, Brion returned to action as Geo-Force with a new group of Outsiders in 1993's Outsiders #1: Alpha. Framed for the murder of his sister-in-law IIona, Brion and this new group traveled as fugitives until they were able to catch the real killer, a vampire named Roderick. Geo-Force also met the new Terra, a young woman plucked from time who was unsure of her identity. Unsure if she was an amnesiac version of his sister or not, Brion welcomed her into his life and invited her to live in Markovia with him. He and the new Terra grew close, and he made it clear he valued her as family regardless of her genetic nature. As the second group of Outsiders began to drift apart, Brion married his girlfriend Denise and remained in Markovia as its ruler, until his nephew could come of age. Next, Geo-Force joined the Justice League, but found his powers were evolving and becoming similar to those exhibited by his late sister. Deathstroke told Brion that only he had the serum to allow him to control his powers once more, and he would only supply it after Geo-Force agreed to spy on the Justice League. Brion was horrified to find himself in the same position his sister once was. He pretended to go along with Deathstroke’s plan, and told the League everything that was happening. In the 2008 limited series DC Universe: Last Will and Testament (written by Brad Meltzer and penciled by Andy Kubert), Geo-Force decided to have an ultimate showdown with Deathstroke and avenge his sister. 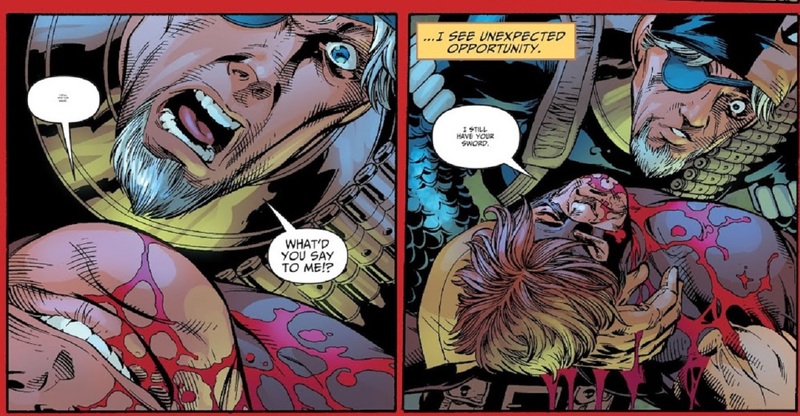 When Deathstroke gained the upper hand, Brion slashed his own neck, robbing Deathstroke of the victory he desired. While he was caught off guard, Brion used Slade’s sword to stab the assassin through the chest. Both men survived the encounter. Although Tara had not been avenged, Brion’s attack dealt a heavy blow to Slade’s ego. Brion wound up joining yet another new incarnation of Batman's Outsiders; and when the Dark Knight disappeared Geo-Force assumed leadership of the group. 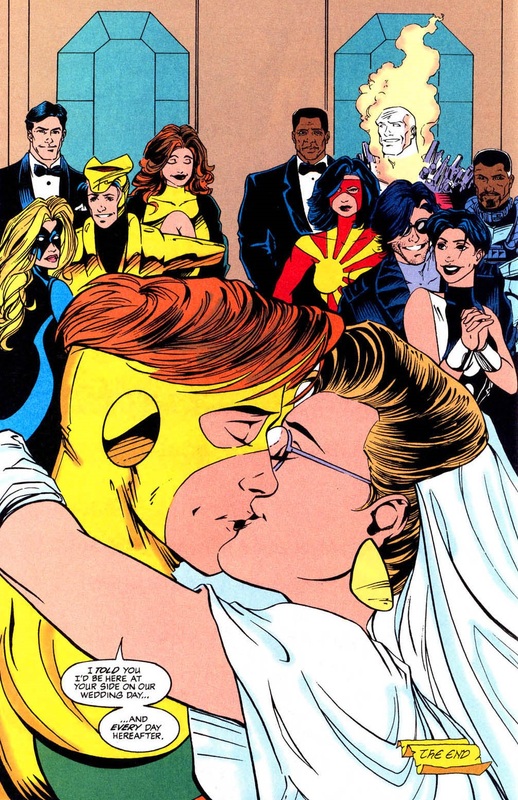 In 2010's Outsiders #33 (written by Dan Didio and Phillip Tan, penciled by Phillip Tan), it was revealed that Brion’s marriage to Denise had been short-lived. Because Denise was not of Markovian blood, the courts rejected their marriage, and Brion chose kingdom over love, causing the union to be annulled. Heartbroken, Denise attempted to undergo the same treatment Brion and Tara had gone through, in order to grow closer to her former husband. The procedure gave her powers, but since she wasn’t of Markovian blood it had a nasty side effect on her body and mind. Encased in rock, she became the villainous Geode and murdered innocent citizens of her husband’s kingdom. Geode teamed up with another villain named Veritas, in an attempt to cause political turmoil in Markovia and break Geo-Force. 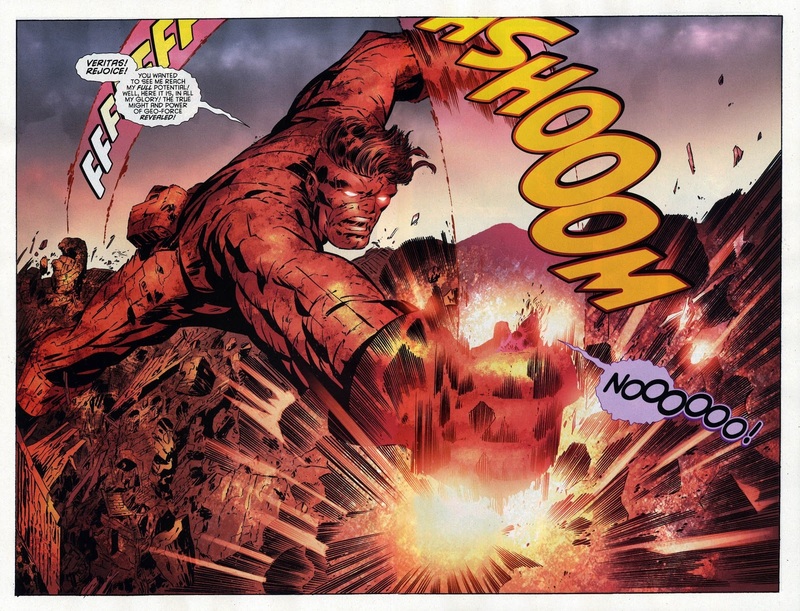 The duo manipulated Geo-Force into tapping into more of his powers, and Brion used pieces of Markovian land to turn into a giant rock monster, killing his two enemies, destroying his kingdom, and horrifying the Outsiders. Batman arrived in Markovia to try to contain the situation, but Geo-Force had already alienated all of his teammates. 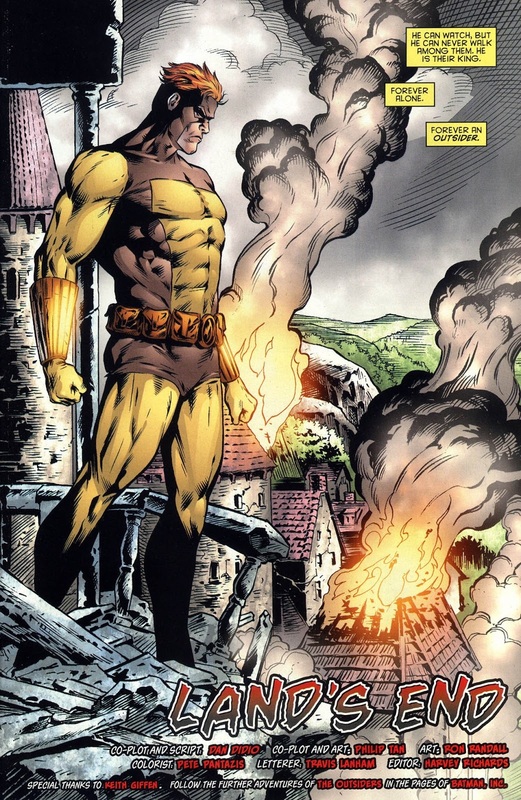 As Batman and the Outsiders left Markovia, Brion stayed behind in the ruins of his kingdom, contemplating his solitude and feeling that he was now truly an Outsider. After the events of 2011's Flashpoint reimagined the history of the DC Universe, Brion’s past as Geo-Force was forgotten. A new version of Brion was first seen in 2016's Suicide Squad Most Wanted: Deadshot and Katana #3 (written by Brian Buccellafo and penciled by Viktor Bogdanovic). In this story, Brion and Katana, unaware of their prior history, worked together to stop the terrorist Kobra from invading Markovia. 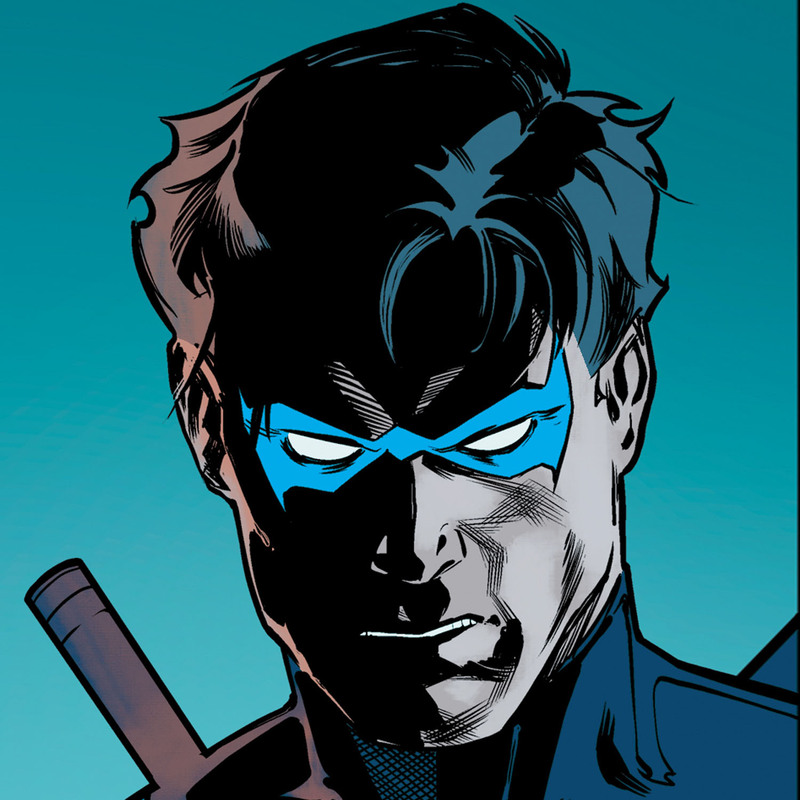 Although Brion possessed no visible powers in 2017's Dark Days: The Forge (written by Scott Snyder and James Tynion IV, penciled by Jim Lee, Andy Kubert, and John Romita Jr.) revealed that he eventually became Geo-Force and joined Batman’s Outsiders to conduct covert ops missions. 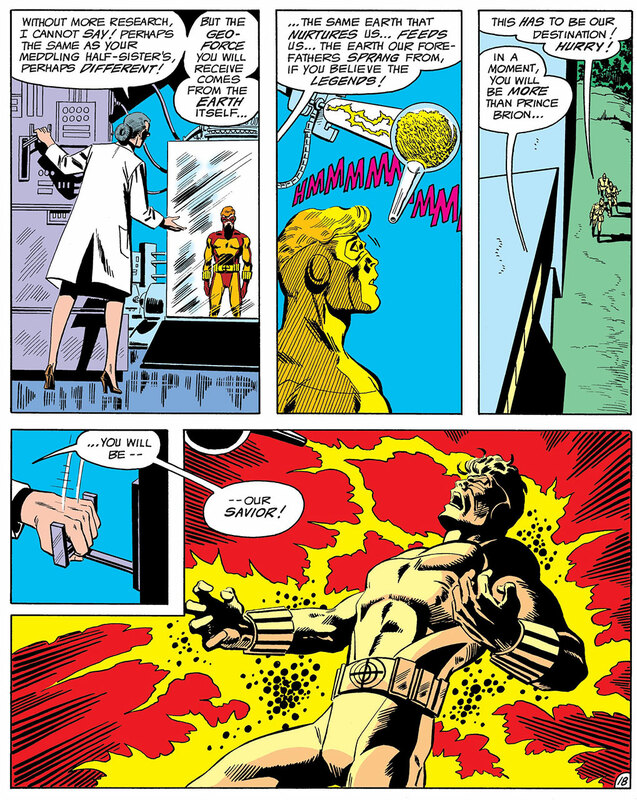 2018's Doomsday Clock (written by Geoff Johns and penciled by Gary Frank) revealed that, like his pre-Flashpoint predecessor, the new Brion gained his powers from the genetic experiments of Dr. Jace. Comics aren’t the only medium in which you can catch Brion. 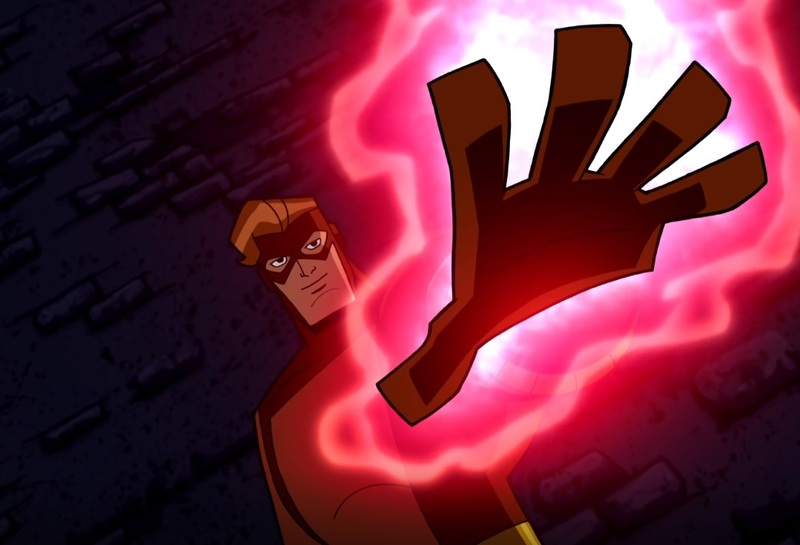 Geo-Force, along with the rest of the original Outsiders, helped Batman take on Kobra in the Batman: The Brave and the Bold episode “Requiem for a Scarlet Speedster” (pictured above). In live-action TV, Brion was re-imagined as a scientist in the Arrow season 1 episode “Darkness on the Edge of Town”. In this episode, Brion built a seismic weapon for Malcolm Merlyn (played by DC Daily’s own John Barrowman), who killed him once the device was built. Thankfully, Geo-Force can now be seen in Young Justice: Outsiders, in which he trains to be a hero alongside Halo and Forager. Are you a Geo-Force fan? Let us know in our Community!